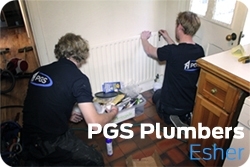 Local businesses and property owners in and around Esher rely on PGS Plumbers as we can provide the skilled engineers needed to tackle any plumbing and heating job. From boiler installations to fixing water leaks and installing brand new bathrooms, PGS Plumbers offer highly competitive prices for the impeccably high standard of workmanship that we are proud to provide. We have a dedicated team of call centre staff who manage our local plumbers in Esher. Having this kind of business set up means that you will always get the high level of customer support that you'd expect from a modern plumbing company, but still have a local plumber who you'll get to know. Being proud of the plumbing services in Esher that we provide is also the reason why we offer a labour guarantee for all the work we complete. If an unlikely fault developes as a result of our work - or you're not happy with the recent work completed - we'll come back and fix it free of charge. Call us now to help fix your plumbing and heating problems.